Unless you live under a rock, you have probably noticed more and more videos on your Facebook feed. From funny cat videos, Tasty recipes to sponsored ads for a product or service you may want, video is everywhere. Using video on social media, especially on Facebook, is an excellent marketing tool that you should not overlook. Studies show that video is more engaging, great for SEO and one of the most versatile and lucrative digital marketing tools out there. Keep reading below to learn five video marketing benefits for social media and why you should invest. Let’s start with some statistics in case you’re on the fence. 86% of business-related video views take place on desktop browser and only 14% on mobile. 18 is the average number of videos published by businesses each month. 85% of business now have internal staff and resources to produce videos in-house. Businesses have an average of 293 videos in their library. 56% of all videos published in the last year are less than two minutes long. Websites and social are the most popular video distribution channels, and the most popular videos are in the form of explainers, product demos, how-tos and testimonials. Top 5% of videos retain an average of 77% of viewers to the last second. The average video retains 37% of viewers all the way to the end of the video. Videos under 90 seconds see an average retention rate of 53%, but videos more than 30 minutes retain only 10%. The average retention rate of personalized videos is 35% higher than non-personalized videos. Your business needs video. The numbers don’t lie. 51.9% of marketing professionals worldwide name video as the type of content with the best ROI. Below I outline five main reasons video works so well in general and on Facebook. Sometimes, written text is just not as effective as images. If you are trying to explain a difficult concept or showcase a new product, video may be your best bet. 98% of users say they’ve watched an explainer video to learn more about a product or service. Consider creating explainer videos or how to videos where demonstrations will be helpful. Animated videos work well, too. Animated videos are a great combination of entertainment, nostalgia and simplicity. Video marketers must remember that people share emotions, not facts. According to a study, 76% of users say they would share a branded video with their friends if it was entertaining. Even though emotions may not be ROI, social shares can increase traffic to your site. And if you have a high performance, mobile-friendly website, you can close the deal. If you are in the healthcare field, producing videos that showcase your nurses, doctors or office staff builds rapport. 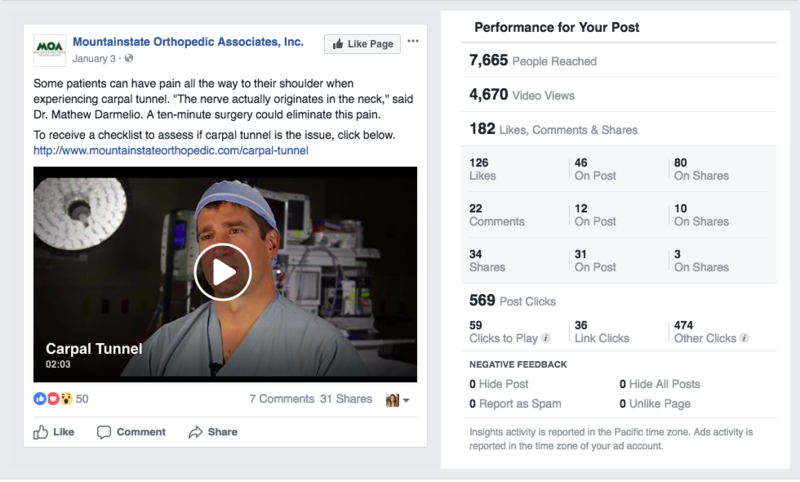 From our own advertising experience, doctor videos generate the most engagement. Consumers LOVE being able to praise them and share their experiences. You’ll be amazed at how many shares, likes and loves a doc vid receives. Video and mobile go hand in hand. People like being able to watch video on the go. Smartphone video viewers are 1.4x more likely to watch ads on their devices as TV and desktop viewers. They are also 1.4x more likely to pay attention to ads or branded content on YouTube. If you aren’t showcasing your video on Facebook, your competitor is. Video allows you to increase the time spent by visitors on your site. Longer exposure builds trust and signals search engines that your site has good content. You are 53 times more likely to show up first on Google if you have a video embedded on your website. Keep in mind, you need to optimize your videos for SEO. Write your titles and descriptions around keywords you want to rank for. Add links back to your website, products or service page. Make sure your video has a distinct call to action (CTA) so the potential customer can take the next step. Videos can be very lucrative for your business. One study shows that when you add a product video on your landing page, you can increase conversions by 80%. Another study also shows that 74% of users who watched an explainer-video about a product, bought it. If you are promoting a product or service video on Facebook, make sure you include a link to the page where the potential customer can buy/call/sign up, etc. If you don’t have the means to produce video in-house, that’s where we can come in. We have a team of professionals who can guide you through the video production process to create a film you’re proud of. We will help you develop a concept and script to make sure we produce a video that will give you that extra pop over your competitor.